Amazon Handmade, Amazon's answer to Etsy, is no longer an ecommerce novelty for artisans. While TheStreet says it's "Not the Etsy Killer It Was Made Out to Be," it's become popular enough since its launch in Fall 2015 that the challenge for sellers is not simply finding customers. The challenge is the same as on other marketplaces: how to stand out from the crowd; how to manage listings efficiently, and how to synchronize inventory and sales across multiple channels. In an interview last fall, Amazon's April Lane told us the site was launched because Amazon typically gets "thousands of searches a day for items related to handmade." So how is Amazon doing compared to other marketplaces like eBay and Etsy? Some Handmade artist-sellers gave us their views. "I have never sold on eBay, but I believe the difference between Etsy and Handmade at Amazon selling venues is the expectation on Amazon that the artists there are professionals," says Tara Reid of Ontario, Canada-based Starletta Designs. "I feel like Amazon provides more authentic information for buyers when purchasing handmade items, which gains more respect and confidence in buyers purchasing from a single person running a handmade business. Amazon holds sellers to a much higher standard, in my opinion." "With eBay, customers are always looking for the cheapest price possible and I never had a great deal of success selling my prints there," says Chris Guiher of North Canton Ohio who sells decorative prints on vintage dictionary pages on Vintage Book Art Co. "Etsy is a great platform for artisans who are looking to launch their online business. Over the past three years I have had steady sales through Etsy." It's the amount of traffic Amazon attracts that makes Handmade a good fit for Guiher. 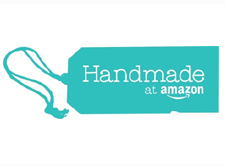 "Handmade at Amazon has gone from an additional revenue stream when I launched my shop in October of this past year to my primary source of business. Because of Amazon's vast customer base, I do see sales that far surpass my sales on other online marketplaces such as Etsy." Having heard that the Fulfillment By Amazon (FBA) shipping service brings more sales to sellers who use it, especially because FBA ensures two-day shipping, I asked if the two use FBA and if it helps boost their bottom lines. "I do believe that it does entice more customers to purchase my items," says Guiher. "Since all my prints are available with free Prime shipping, I believe this encourages Prime members to purchase my products over other similar items on Amazon that may not be available with Amazon Prime." The time saved in fulfillment enables the artist to focus on creating new designs. Reid also sees FBA as essential to her business operations. "I can't really say for sure if it brings in more sales, but they have remained consistent since I switched to FBA only on December 10th. In Ontario, tracking on shipments is very costly, so the only way I could continue to sell on Amazon was to do FBA. This allows me to focus more on my products - ensuring they are of the best quality possible and making up new designs more often." A third seller, Eric Bladholm, had qualms about using FBA, however. 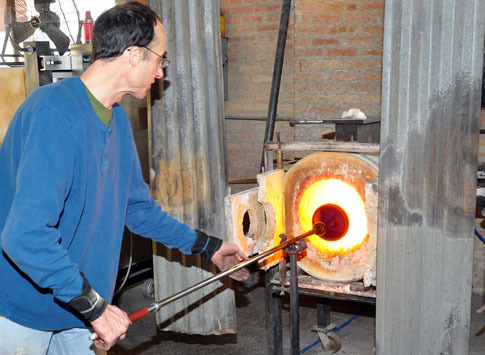 "With a fragile creation, I'm a bit worried about the logistics," the glass blower said. 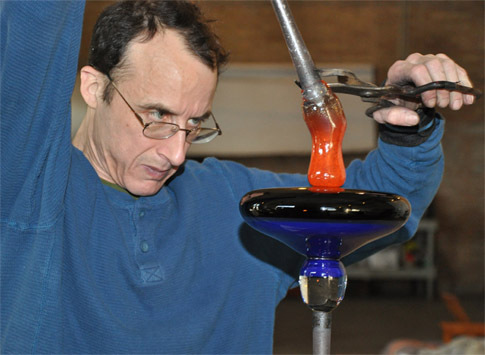 He's based in Chicago and runs Chicago Glassworks. You can seem him working on one of his creations in the accompanying photographs taken by J. Tanner. It's not too late for artisans to move from the traditional world of shows, commissions, and commercial artwork to online sales, Bladholm says. "I primarily do custom lighting and commissions, so all the art glass I make is pretty much one-of-a-kind at this point. I make pieces I enjoy making when the commercial work is slow." So far he's only had a single sale on Handmade at Amazon. "However, other sites where I have a better presence established did extremely well," he points out. "The period from late October through January was my best online quarter ever. I never had time to revamp or adjust inventory on Amazon because I was swamped with other sales, including an open studio in my shop in early December." One of the big challenges for people who make their products by hand is staying on top of their business. After all, they have to handle product design, creation, selling, and (unless they outsource this function) fulfillment. Starletta Designs' Reid, in particular, was overwhelmed this holiday season - and that was a good problem, she says. "Last holiday season I sold over 400 pieces of jewelry on Handmade at Amazon, which was so overwhelming for a one-person shop, but my success there has allowed me to follow my dreams and work full time from home on my business," Reid says. While sales have slowed since then, they have remained consistent, "which is wonderful," she adds. One tip Reid passes along is to get into Handmade now, while it's still free to try out. That's what she did. "I went into it with no expectations and decided to just see how things went, especially since there is currently no out-of-pocket cost for Handmade artisans on the platform." Note that on August 1, the monthly subscription fee of S39.99 will go into effect (you can find fee information on this page on Amazon.com). That's just what Bladholm decided to do. "A friend in the craft community mentioned it plus I saw some press coverage about the launch of the Handmade section and I decided to, at minimum, stake out a spot and get something started that could be expanded in future. I have noticed a trend that more and more shopping of everything is moving online, so I feel like I need to adjust to that." These three sellers had different experiences with selling handmade goods online and on Amazon Handmade. Share your story on the AuctionBytes Blog.